Students are staff are proud to be well above all other Herefordshire schools in latest school performance tables for pupils aged 16-18. For the 55 students who took A-Levels last year at JMHS Sixth Form, the Department for Education progress score was +0.42, well above all other schools in the county. This makes John Masefield the only school in Herefordshire to achieve a rating of ‘well above average’. The only school with more than 20 sixth formers in Worcestershire that achieved the same rating was Malvern College, with a progress score of +0.35, less than John Masefield. 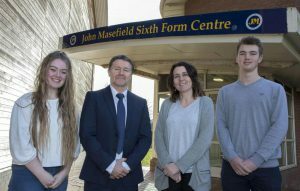 Headteacher, Andy Evans is delighted that students at John Masefield Sixth Form are making better progress than students at many top public schools and grammar schools. He attributes this success to the combination of high-quality rigorous teaching, high expectations of staff of every student and the caring ethos of the school. The performance tables also show that 28 per cent of John Masefield students achieved at least AAB grades in challenging facilitating subjects, compared to a national average of just 12 per cent. Given that John Masefield Sixth Form is an all-ability establishment that aims to nurture every student and has an extremely high completion rate, this represents an excellent achievement.